With Sarah Walker. Including Musical challenge; Music in Time: pianist Harriet Cohen; Artist of the Week: trumpeter Hakan Hardenberger, featured playing HK Gruber's 3 MOB Pieces. Sarah sets the tone and mood of the day's programme with a range of music to intrigue, surprise and entertain, and as Radio 3 visits Hull for its Uproot festival, Sarah will also be featuring classical repertoire throughout the week reflecting folk music from around the world. Sarah's guest this week is the music journalist and broadcaster David Hepworth. David has launched and written for many of the most successful pop-culture magazines of the past 30 years, including Smash Hits, More, Heat, Q and The Word. He was a presenter of BBC2's The Old Grey Whistle Test and co-presented the BBC's coverage of the global charity concert Live Aid. 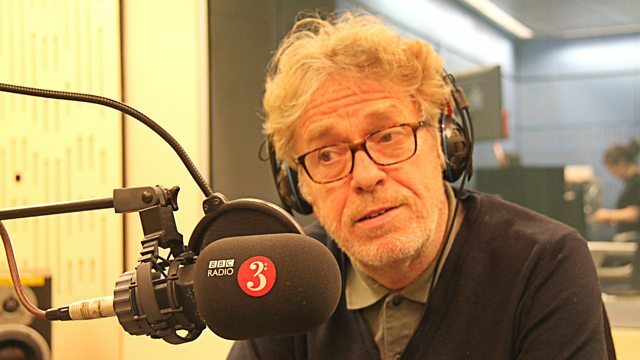 As well as discussing his life's work and reflecting on popular culture, David also shares his passion for classical music choosing a selection of his favourite works. Across the week we'll hear music by composers including Copland, Walton and Philip Glass. Today Sarah's exploring the influence of charismatic British pianist Harriet Cohen on the composers that she knew. Cohen inspired composers such as Bax, Vaughan Williams, Walton and Howells, and invited her composer friends to create a set of transcriptions of works by JS Bach - Sarah shares a selection of these pieces. Sarah's Artist of the Week is the Swedish trumpeter Håkan Hardenberger. During three decades of performing and recording, he's established a reputation for both virtuosity and versatility. His interpretations of classic repertoire such as the concertos of Haydn and Hummel have become benchmarks for the next generation, and Sarah has selected these alongside Bach's Brandenburg Concerto No.2 in F major, widely perceived as one of the most challenging pieces in the trumpet repertoire. But, Hardenberger is also committed to championing contemporary works. Sarah's selections include Pärt's Concerto Piccolo on B-A-C-H and Takemitsu's Paths - both of which were dedicated to, and premiered by him - as well as HK Gruber's 3 MOB Pieces. Performer: Håkan Hardenberger. Performer: Roland Pöntinen. Orchestra: Mariinsky Orchestra. Conductor: Valery Gergiev. Performer: Yuri Serov. Singer: Alexander Gergalov. Performer: Andrew Lawrence‐King. Ensemble: Harp Consort. Orchestra: Simón Bolívar Symphony Orchestra. Conductor: Enrique Diemecke. Ensemble: The Stan Tracey Quartet. Performer: Daniel Hope. Music Arranger: Olivier Fourés. Ensemble: Daniel Hope & Friends. Performer: Ingrid Andsnes. Choir: Norwegian Soloists' Choir. Conductor: Grete Pedersen. Performer: Harriet Cohen. Music Arranger: Harriet Cohen. Performer: Jonathan Plowright. Music Arranger: Arnold Bax. Performer: Richard Watkins. Performer: Ian Brown. Performer: Julius Drake. Singer: Joyce DiDonato. Performer: Johannes Moser. Orchestra: Suisse Romande Orchestra. Conductor: Andrew Manze. Conductor: Claudio Abbado. Orchestra: Berlin Philharmonic Orchestra.